Why should I give you my SSH credentials? With your SSH credentials, we’ll be able to troubleshoot faster if something goes wrong. VaultPress will perform better on your site. And, you’ll be able to use the one-click restore to get your site back. Not all hosts or hosting plans allow SSH access, but if you have SSH credentials we recommend adding them! We recommend entering both FTP and SSH credentials if you can. FTP will give us access to your files. SSH will provide access to your files, too, and usually will also provide access to your database, which can be crucial if something goes wrong with your site. How do I add my SSH credentials? This will open the Settings screen. Enter your Server Address, Port Number, Username and Password as provided by your host. 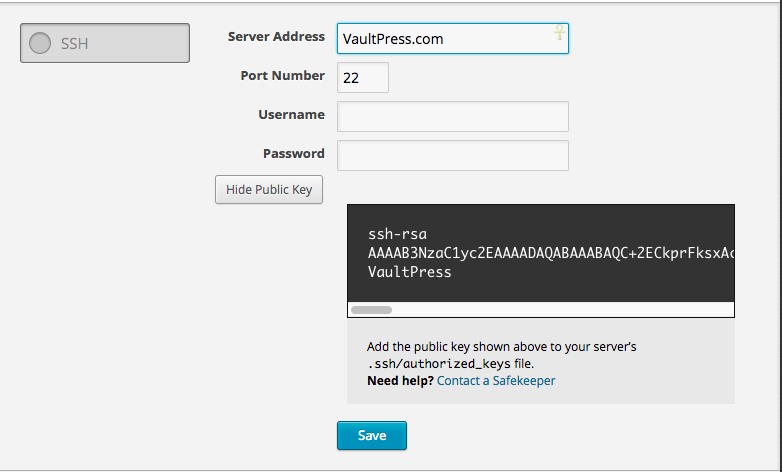 Click the Show Public Key button to reveal the VaultPress public key file. Copy that and add it to your server’s .ssh/authorized_keys file. If you’re not sure how to do this, your host can help with that. Where can I find my SSH credentials? If your host is not listed here, or if you’re having any problems, please contact your host directly and ask them for your SSH credentials.